The “Sunshine List”, a list of Ontario’s public service who make more than $100,000 a year, was brought in under the Harris government in 1996, in an effort to increase transparency about just how much the top paid public servants were earning. Now the list is released each year by the Ontario Ministry of Finance. However, there has been some frustration that the data are not in the most easily accessible format (HTML & PDF? Really guys?). 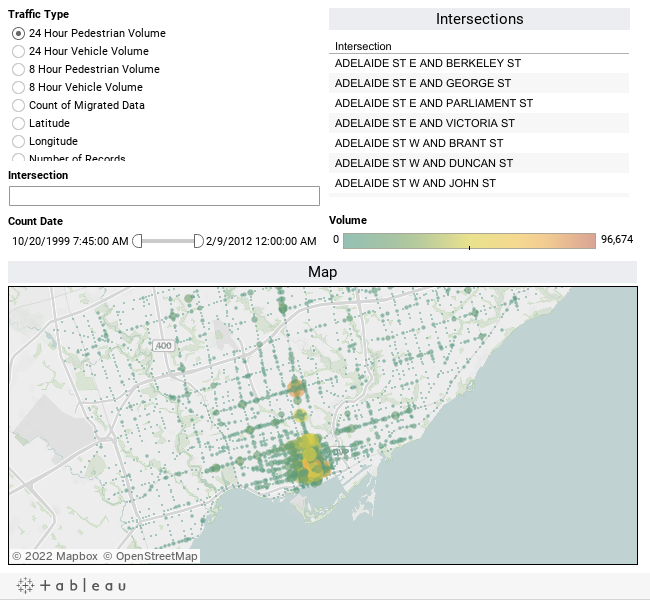 Stuart A. Thompson was kind enough to provide the data in an easier to digest format (Nick Ragaz also provided it in CSV), as well as producing a tool for exploring it on The Globe and Mail. I thought it’d be great to get a more visual exploration of the data at fine granularity, so have produced this interactive visualization below. You can filter the data by searching by employer, name, or position. 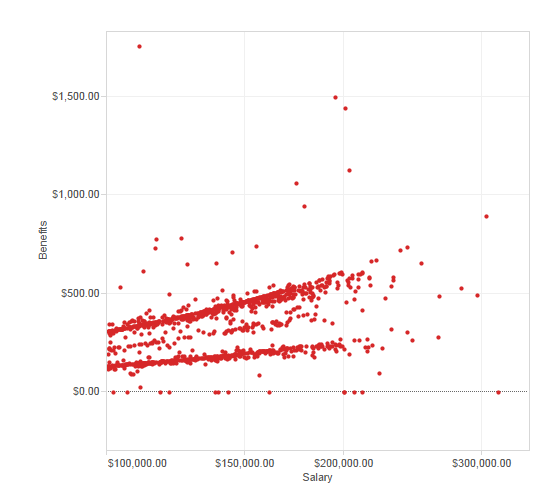 You can also filter the list by selecting points or groups of points on the scatterplot on the left, and highlight groups of points (or individual employees) by selecting components in the bar graph at the right. The bar graph on the right can also be expanded and collapsed to view the aggregate salary and benefits by employer, or to view the quantities for individual employees. 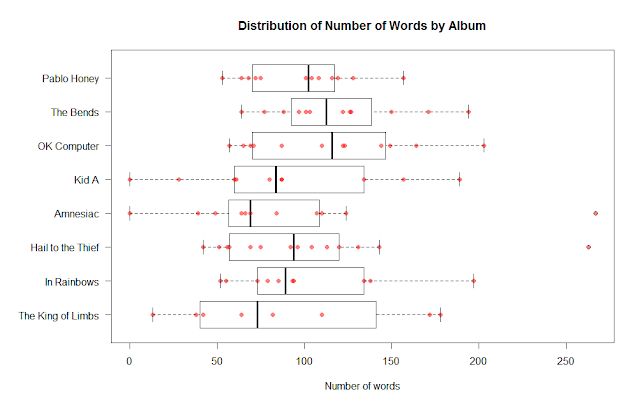 Hovering over data points on either graph will display the related data in a tooltip – I’ve found this is handy for looking at individual points of interest on the scatterplot. Zoom and explore to find interesting patterns and individuals. Give it a try! 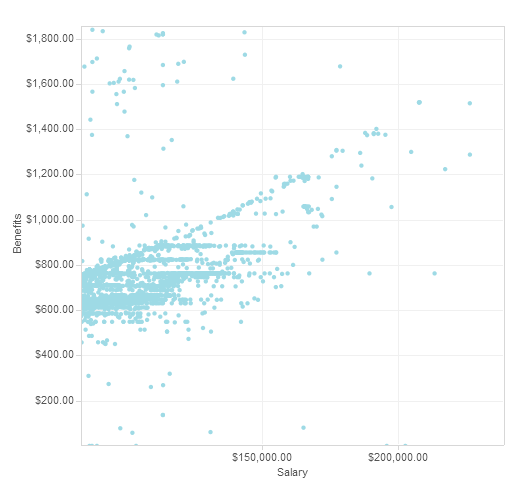 I’ve plotted benefit against salary with the latter having a logarithmic axis so that the data are easier visualized and explored (note that I am in no way suggesting that benefits are a function of salary). 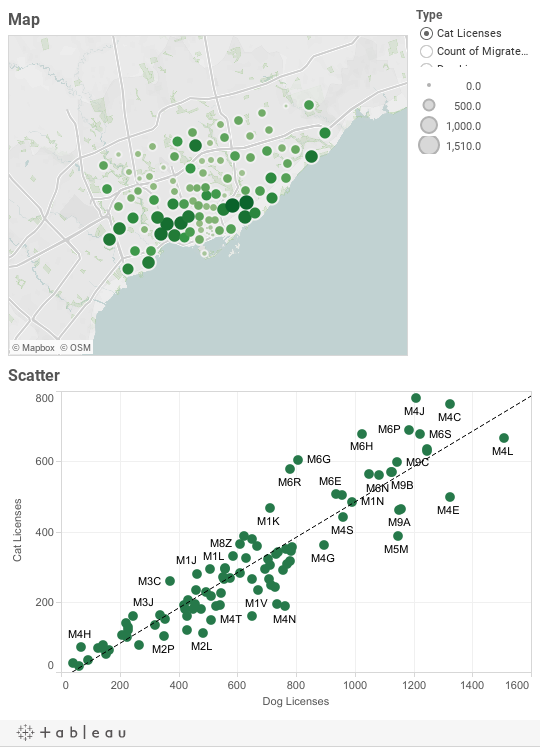 Using combinations of all these possible interactions mentioned above you can do some interesting visual analysis: for instance, how do the top salaries and benefits earned by Constables across police departments in Ontario differ (seriously, take a look)? What are the relative pay and benefit levels of professors at Ontario Universities on the list? How much does Rob Ford make? Hope this tool will be interesting and useful for those interested in the list. As always feedback is welcome in the comments. In case you don’t read anything online, or live under a rock, the internet is all atwitter (get it?) with the recent news that Snapchat has had 4.6 million users’ details leaked due to a security flaw which was compromised. The irony here is that Snapchat was warned of the vulnerability by Gibson Security, but was rather dismissive and flippant and has now had this blow up in their faces (as it rightly should, given their response). It appears there may be very real consequences of this to the (overblown) perceived value of the company, yet another wildly popular startup with no revenue model. I bet that offer from Facebook is looking pretty good right about now. Which is awesome – kudos to those guys, once for being whitehat (they obscured two digits of each phone number to preserve some anonymity) and twice for keeping companies with large amounts of user data accountable. Gibsonsec has provided a tool so you can check if your account is in the DB here. However, if you’re a datahead like me, when you hear that there is a file out there with 4.6M user accounts in it, your first thought is not OMG am I safe?! 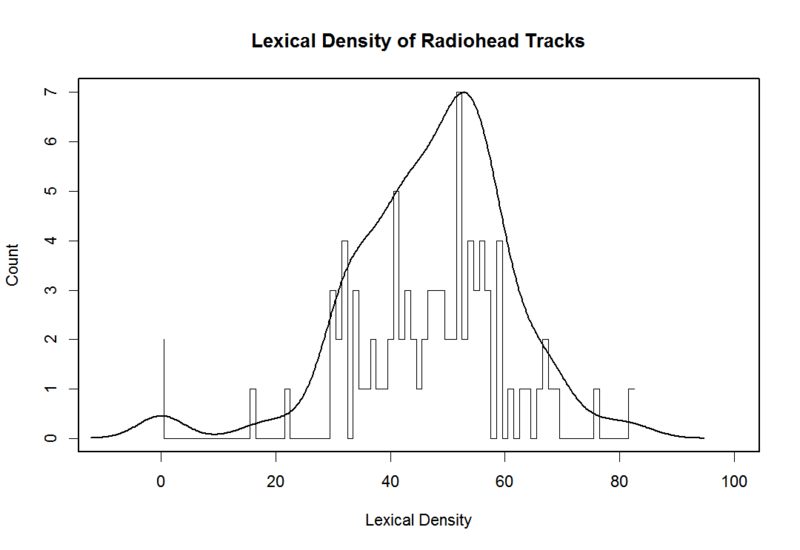 but let’s do some analysis! As I have noted in a previous musing, it’s difficult to do any sort of in-depth analysis if you have limited dimensionality of your data – here only 3 fields – the phone number with last two digits obscured, the username, and the area. Fortunately because some of the data here is geographic, we can do some cool visualization with mapping. First we look at the high level view, with state and those states by area. California had the most accounts compromised overall, with just shy of 1.4 M details leaked. New York State was next at just over a million. Because the accounts weren’t spread evenly across the states, below is a more detailed view by area code. You can see that it’s mainly Southern California and the Bay Area where the accounts are concentrated. Well, that covers the geographic component. Which leaves the only the username and phones numbers. I’m not going to look into the phone numbers (I mean what really can you do, other than look at the distribution of numbers – which I have a strong hypothesis about already). Looking at the number of accounts which include numerals versus those that do not, the split is fairly even – 2,586,281 (~56.1%) do not contain numbers and the remaining 2,023,340 (~43.9%) do. There are no purely numeric usernames. The remainder of the tail is not present, which I assume would fill in if there were more data. 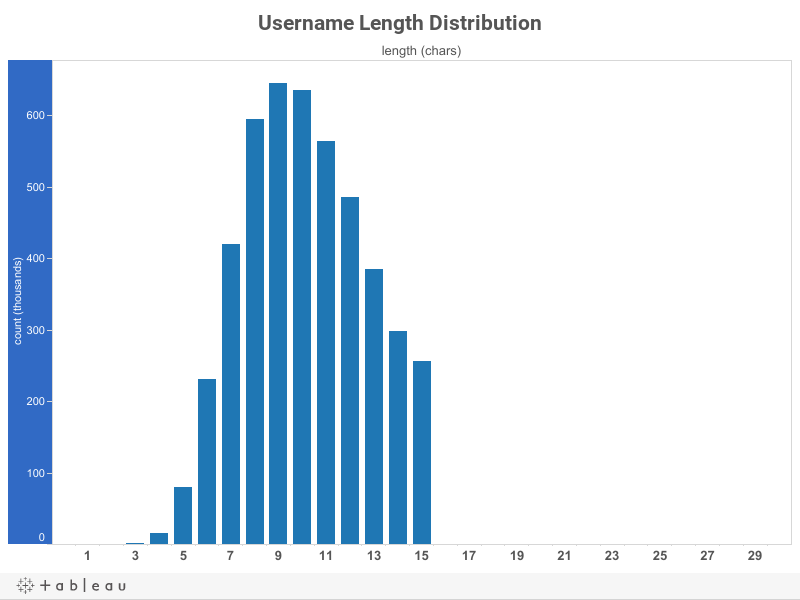 I had the axis stretch to 30 for perspective as there was one username in the file of length 29. I’m not in the leak, so I’m not concerned. But once again, this stresses the importance of being mindful of where our personal data are going when using smartphone apps, and ensuring there is some measure of care and accountability on the creators’ end. Snapchat has released a new statement promising an update to the app which makes the compromised feature optional, increased security around the API, and working with security experts in a more open fashion. Make it easy on your other developers (and the rest of the world in general) by labeling your <div> containers and other elements with ids (which are unique!!) or at least classes. Otherwise how are people going to scrape all your data and steal it for their own ends? I joke… kind of. It’s raining cats and dogs! No, I lied, it’s not. 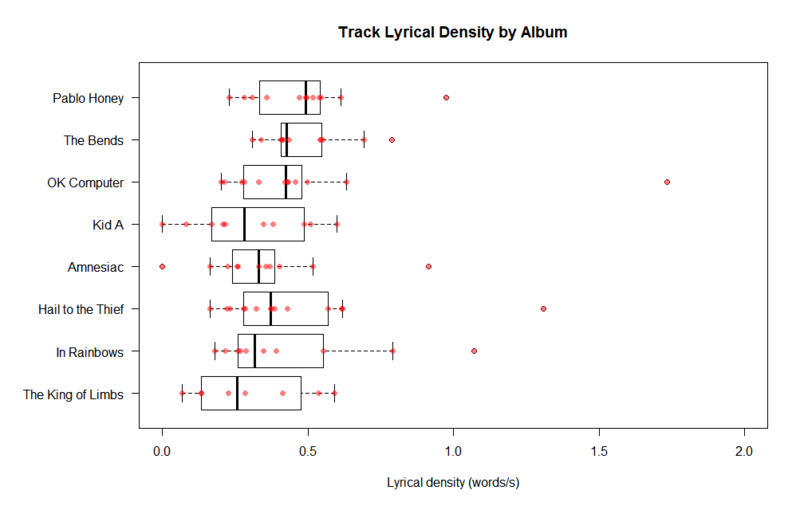 But I wanted to do so more data viz and work with some more open data. So for this quick plot I present, Cat and Dog Licenses in the City of Toronto for 2012, visualized! Above in the top pane is the number of licensed cats and dogs per postal code (or Forward Sortation Area, FSA). 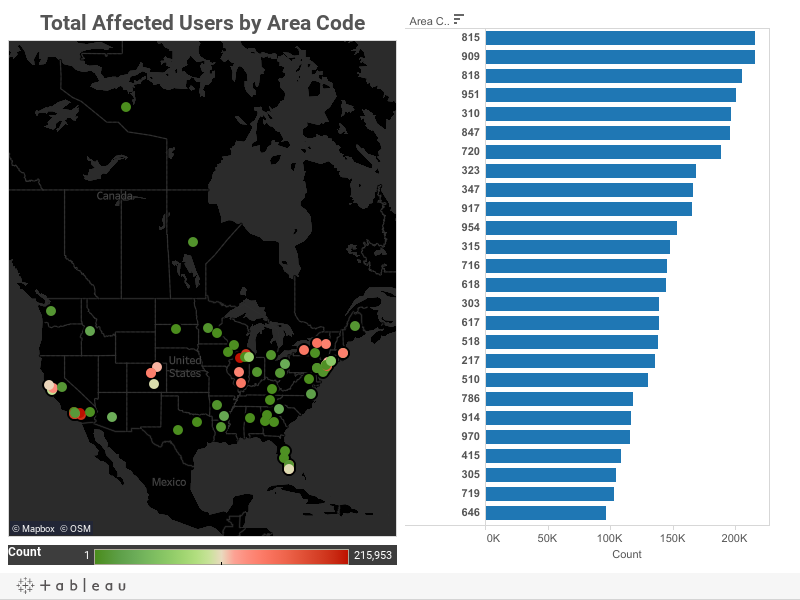 I really would like to have produced a filled map (chloropleth) with the different postal code areas, however Tableau unfortunately does not have Canadian postal code boundaries, just lat/lon and getting geographic data in is a bit of an arduous process. I needed something to plot given that I just had counts of cat and dog licenses per FSA, so threw up a scatter and there is amazing correlation! Surprise, surprise – this is just the third variable, and I bet that if you found a map of (human) population density by postal code you’d see why the two quantities are so closely related. Or perhaps not – this is just my assumption – maybe some areas of the GTA are better about getting their pets licensed or have more cats and dogs. Interesting food for thought. 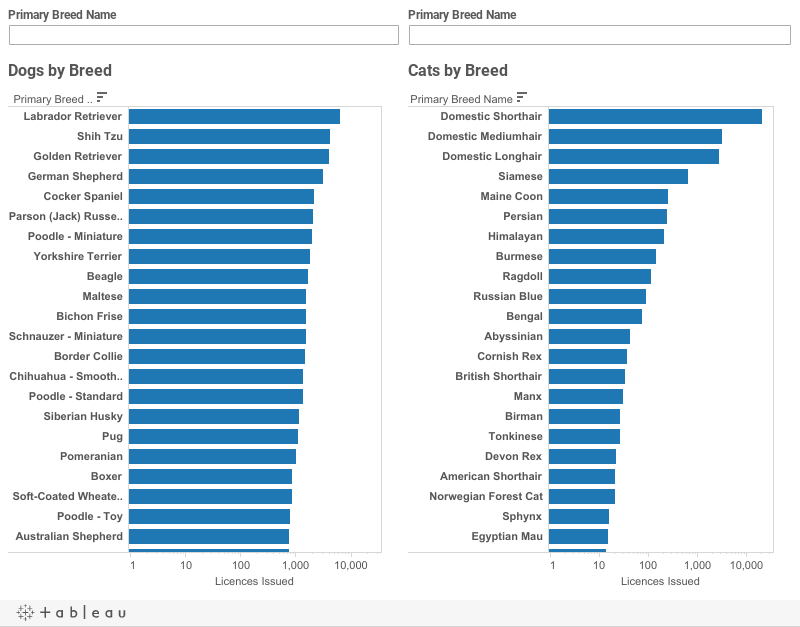 Above is the number of licenses per breed type. Note that the scale is logarithmic for both as the “hairs” (domestic shorthair, domestic mediumhair and domestic longhair) dominate for cats and I wanted to keep the two graphs consistent. The graphs are searchable by keyword, try it out! Also I find it shocking that the second most popular breed of dog was Shih Tzu and the fourth most type of cat was Siamese – really? The people behind Visualising are doing some great things. As well as providing access to open data sets, an embeddable data visualization player, and a massive gallery of data visualizations, they are building an online community of data visualization enthusiasts (and professionals) with their challenges and events. In addition, those behind it (Seed and GE) are also connecting people in the real world with their data visualization marathons for students, which are looking to be the dataviz equivalent of the ever popular hackathons held around the world. 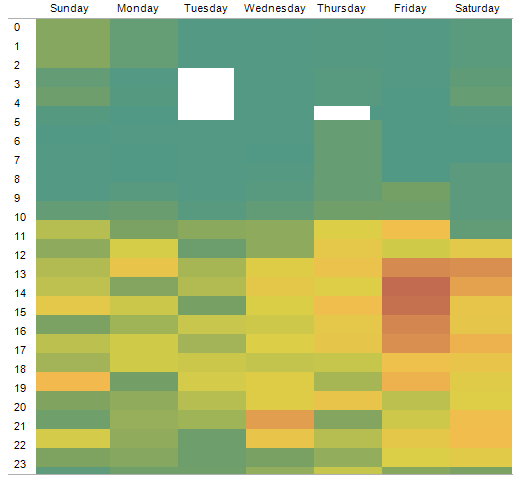 As far as I know no one else is really doing this sort of thing, with a couple notable exceptions – for example Datakind and their Data Dive events (these not strictly visualization focused, however). The latest challenge was to visualize the return on education around the world using some educational indicators from the OECD, and I thought I’d give it a go in Tableau Public. For my visualization I chose to highlight the differences in the return on education not only between nations, but also the gender-based differences for each country. I incorporated some other data from the OECD portal on GDP and public spending on education, and so the countries included are those with data present in all three sets. The World Map shows the countries, coloured by GDP. The bar chart to the right depicts the public spending on education, both tertiary (blue) and non-tertiary (orange), as a percentage of GDP. 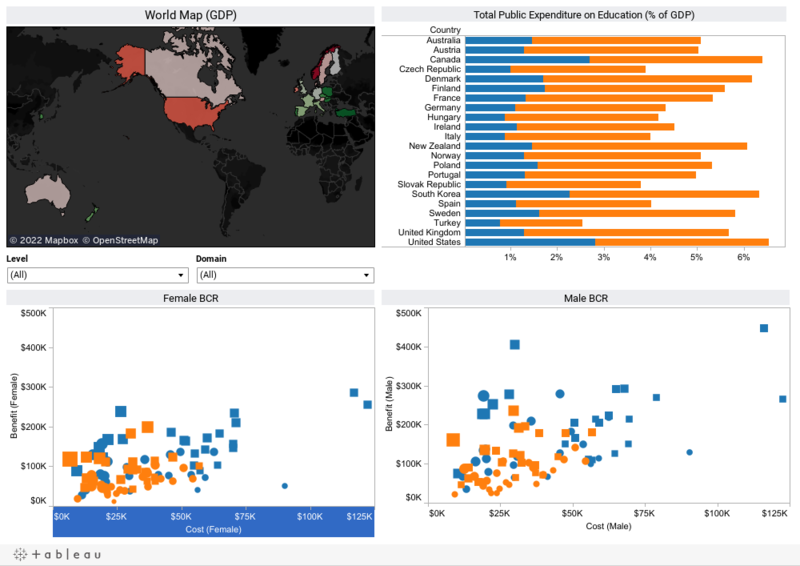 The scatterplots contrast both the gender-specific benefit-cost ratios per country, as well as between public (circles) and private (squares) benefit, and between the levels of education. A point higher up on the plots and to the left has a greater benefit-cost ratio (BCR) than a point lower and to the right, which represents a worse investment. The points are sized by internal rate-of-return (ROR). 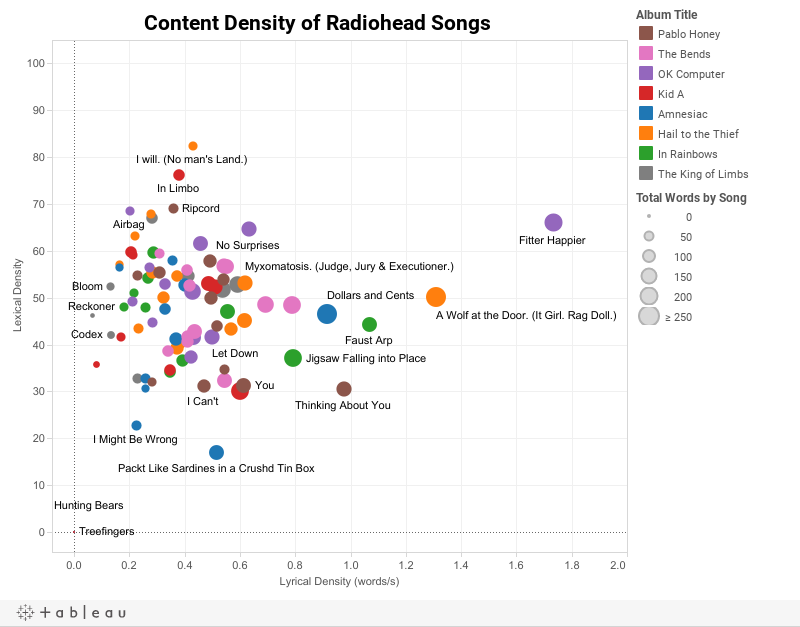 All in all it was fun and not only did I learn a lot more about using Tableau, it gave me a lot of food for thought about how to best depict data visually as well. I will confess, I don’t really like texting. I communicate through text messages, because it does afford many conveniences, and occupies a sort of middle ground between actual conversation and email, but that doesn’t mean that I like it. Even though I would say I text a fair bit, more than some other Luddites I know, I’m not a serial texter. I’m not like one of these 14-year-old girls who sends thousands of text messages a day (about what, exactly?). I recall reading about one such girl in the UK who sent in excess of 100,000 text messages one month. Unfortunately her poor parents received a rather hefty phone bill, as she did this without knowing she did not have an unlimited texting plan. But seriously, what the hell did she write? 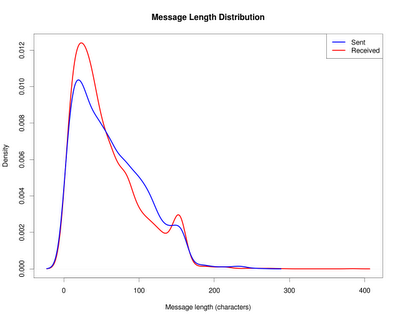 Even if she only wrote one word per text message, 100,000 words is ~200 pages of text. She typed all that out on a mobile phone keyboard (or even worse, a touch screen)? That would be a sizeable book. If you do the math it’s even crazier in terms of time. There are only 24 hours in the day, so assuming little Miss Teen Texter of the Year did not sleep, she still would have to send 100,000 in a 24 * 30 = 720 hour period, which averages out to be about one message every 25 seconds. I think by that point there is really no value added to the conversations you are having. I’m pretty sure I have friends I haven’t said 100,000 words to over all the time that we’ve know each other. Actually getting all the data out turned out to be much easier than I anticipated. There exists an Android App which will not only back up all your texts (with the option of emailing it to you), but conveniently does so in an XML file with human-readable dates and a provided stylesheet (!).  Import the XML file into Excel or other software and boom! 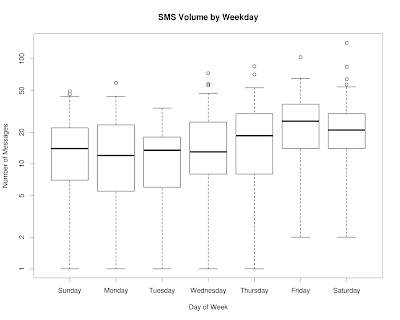 You’ve got time series data for every single text message you’ve ever sent. My data set spans the time from when I first started using an Android phone (July 2011) up to approximately the present, when I last created the backup (August 13th). 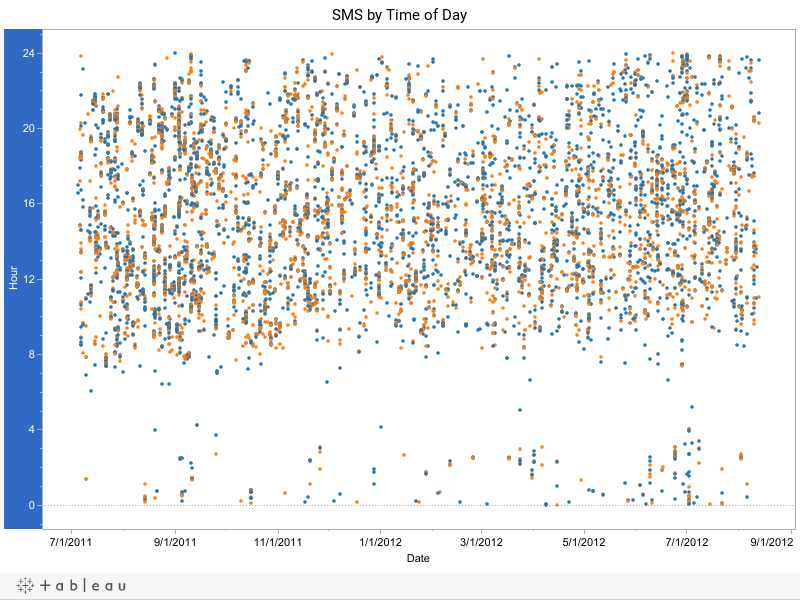 In total over this time period (405 days) I sent 3655 messages (~46.8%) and received 4151 (~53.2%) for a grand total of 7806 messages. 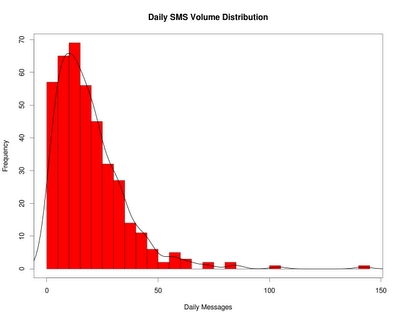 This averages out to approximately 19 messages / day total, or about 1.25 messages per hour. As I said, I’m not a serial texter. Also I should probably work on responding to messages. 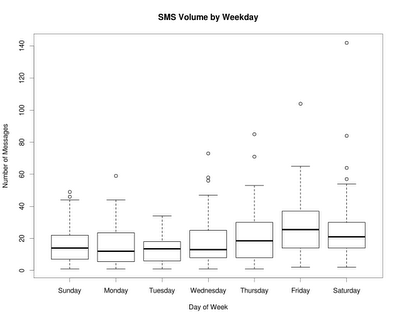 Looks like the majority of my texting occurs between the hours of 8 AM to midnight, which is not surprising. As was established in my earlier post on my sleeping patterns, I do enjoy the night life, as you can see from the intermittent activity in the range outside of these hours (midnight to 4 AM). As Dr. Wolfram commented in his personal analytics posting, it was interesting to look at the plot and think ‘What does this feature correspond to?’ then go back and say ‘Ah, I remember that day!’. It’s also interesting to see the back and forth nature of the messaging. 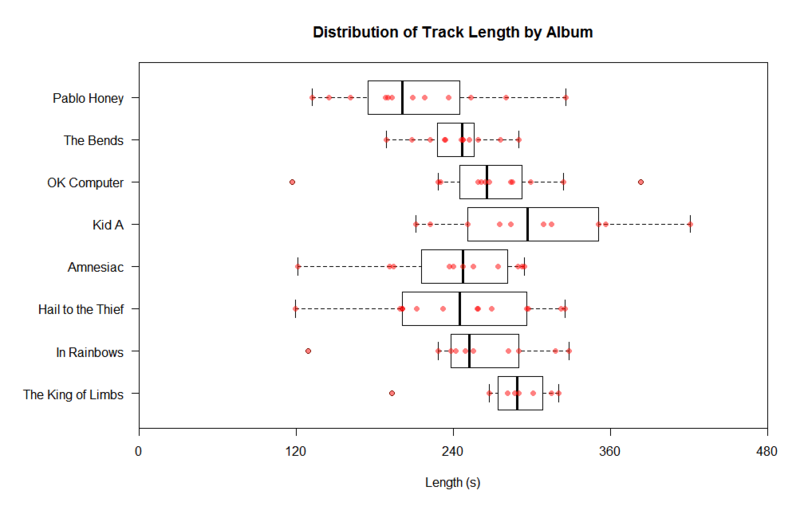 As I mentioned before, the split in Sent and Received is almost 50/50. This is not surprising – we humans call these ‘conversations’. Interesting to note here the spiking phenomenon, in what appears to be a somewhat periodic fashion. This corresponds to the fact that there are some days where I do a lot of texting (i.e. carry on several day-long conversations) contrasted with days where I might have one smaller conversation, or just send one message or so to confirm something (‘We still going to the restaurant at 8?’ – ‘Yup, you know it’ – ‘Cool. I’m going to eat more crab than they hauled in on the latest episode of Deadliest Catch!’). 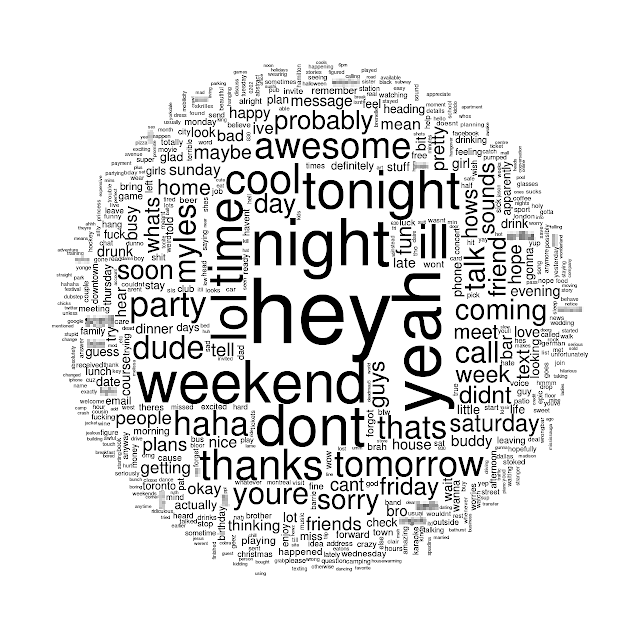 I appeared to be texting more back in the Fall, and my overall volume of text diminished slightly into the New Year. Looking back at some of the spikes, some corresponded to noteworthy events (birthday, Christmas, New Year’s), whereas others did not. For example, the largest spike, which occurred on September 3rd, just happened to be a day where I had a lot of conversations at once not related to anything in particular. 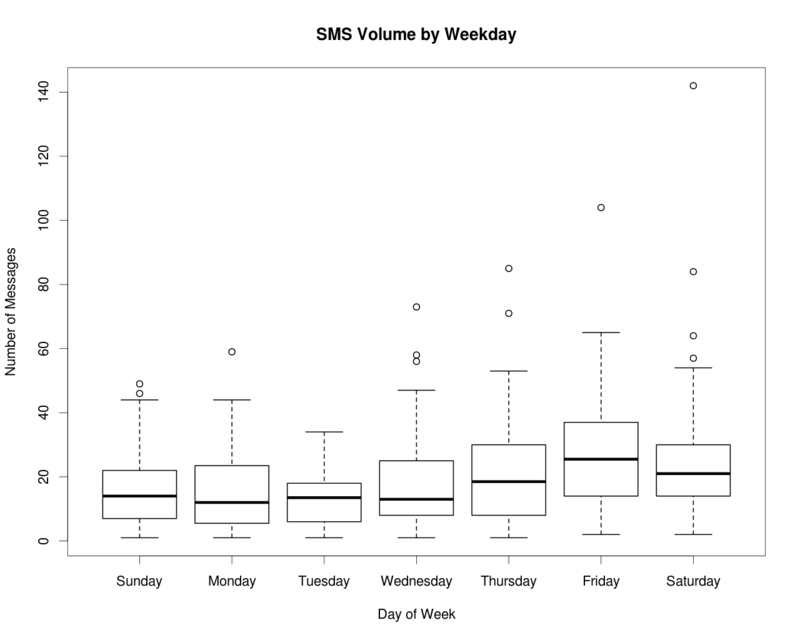 The daily volume follows what appears to be an exponential-type distribution (log-normal?). This is really neat to see out of this, as I did not know what to expect (when in doubt, guess Gaussian) but is not entirely shocking – other communication phenomena have been shown to be a Poisson process (e.g. phone calls). Someone correct me if I am way out of line here. This is way easier to make in Tableau than in R.
As seen previously in the scatterplot, the majority of messages are concentrated between the hours of 8 (here it looks more like 10) to midnight. In line with the boxplot just above, most of that traffic is towards the weekend. In particular, the majority of the messages were mid-to-late afternoon on Fridays. 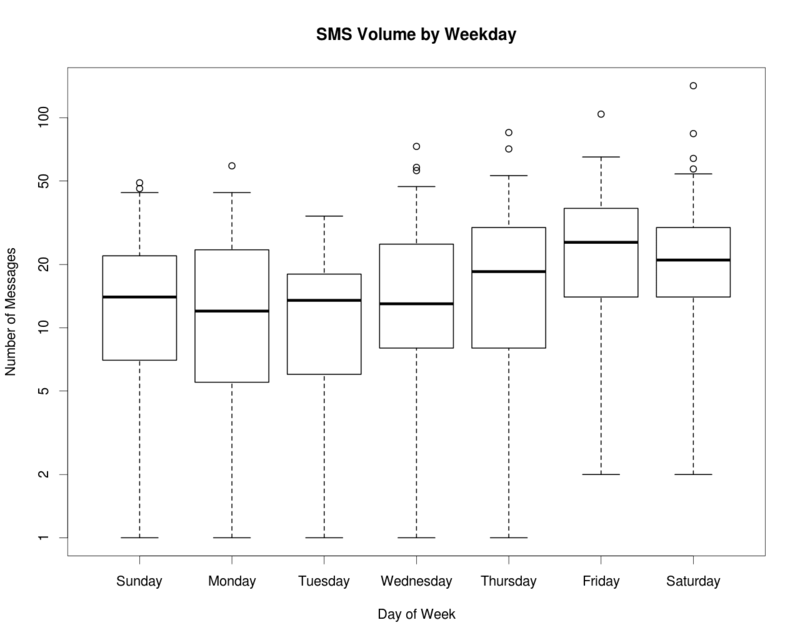 We have thus fair mainly been looking at my text messages as time series data. What about the content of the texts I send and receive? 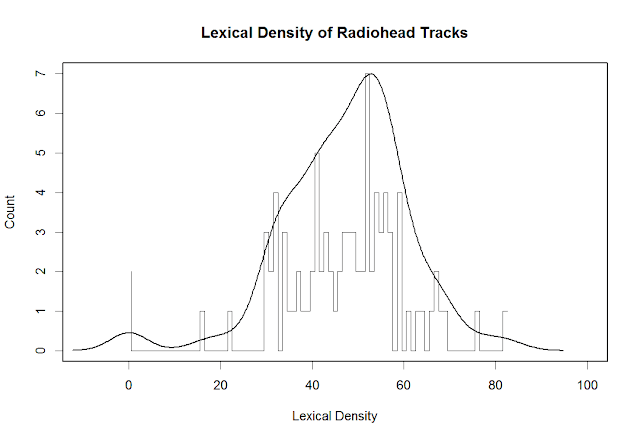 Interestingly, again, the data are distributed in an exponential fashion. You can see distinctive humps at the 160 character mark. 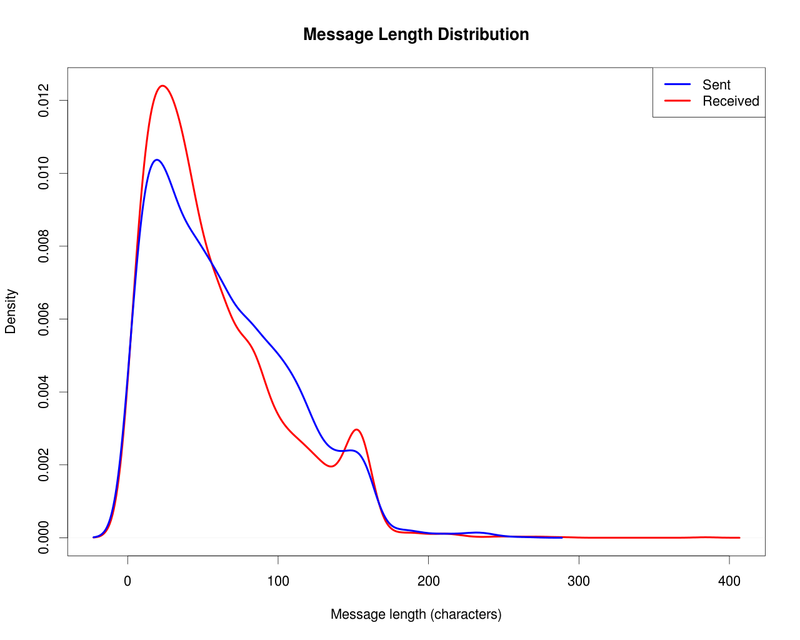 This is due to longer messages being broken down into multiple messages under the max length. Some carriers (or phones?) don’t break up the messages, and so there are a small number of length greater than the ‘official’ limit. Comparing the blue and red lines, you can see that in general I tend to be wordier than my friends and acquaintances. Names blurred to protect the innoncent (except me!). What can we gather from this representation of the text? Well, nothing I didn’t already know…. my phone isn’t exactly a work Blackberry. 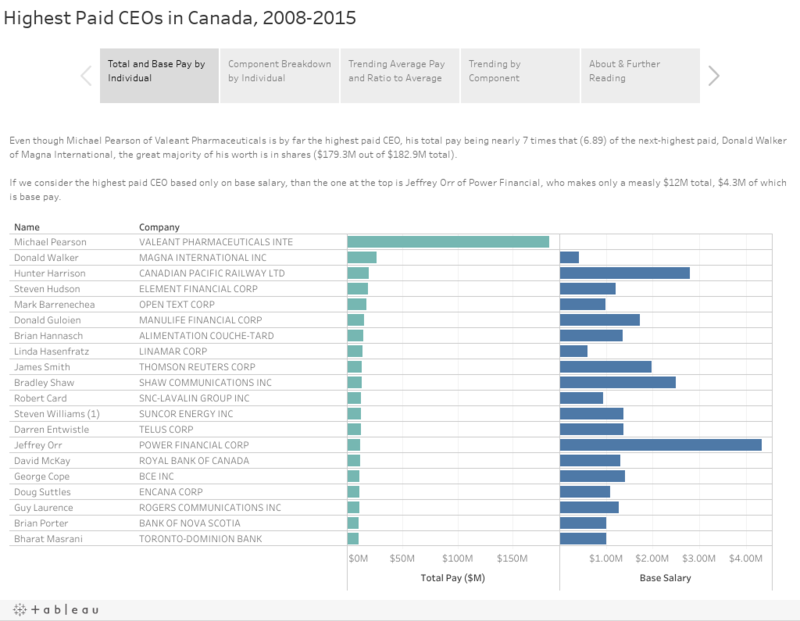 First go at creating something usable with Tableau Public. There’s no search suggestions in the text box filter, but you can type the name of a street and just see those points (e.g. Yonge). Kind of cool. 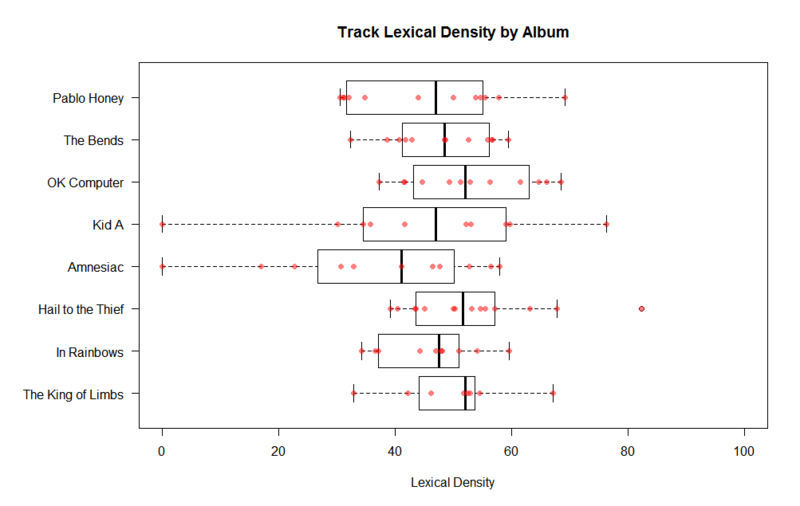 You can find the original data set here. Prior art here and here. P.S. 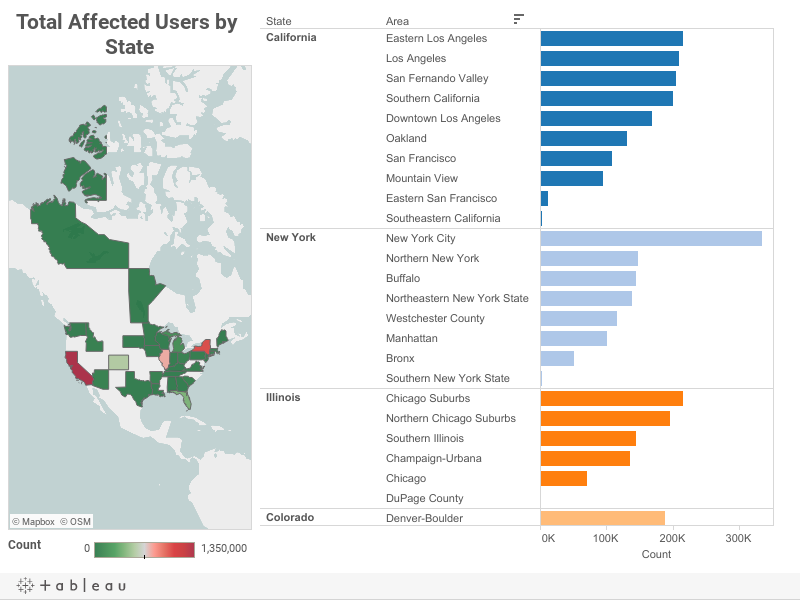 Tableau Maps are not the same as Google Maps. Hold shift and click and drag to pan.